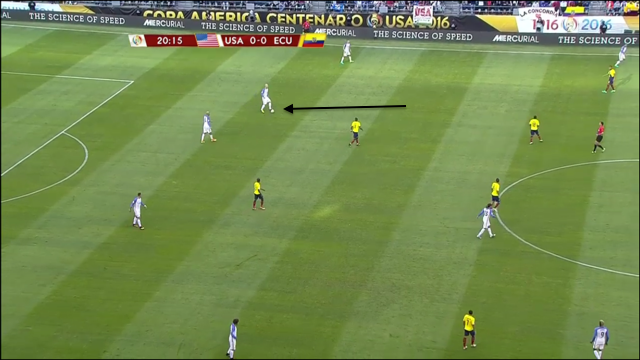 Michael Thomas provides detailed tactical insight on the Copa America quarter-final that finished USA 2-1 Ecuador. 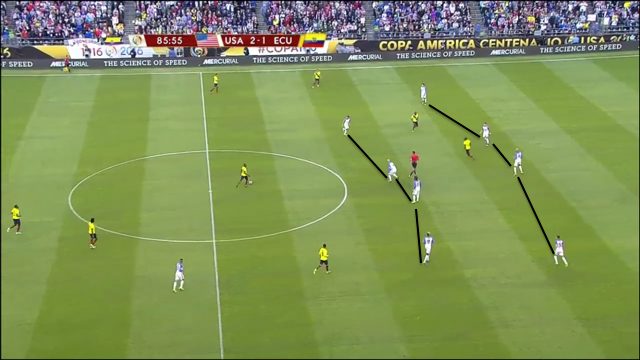 The Americans opened their first match against Colombia by attempting to control the run-of-play through emphasizing possession in a progressive 4-3-3 formation. 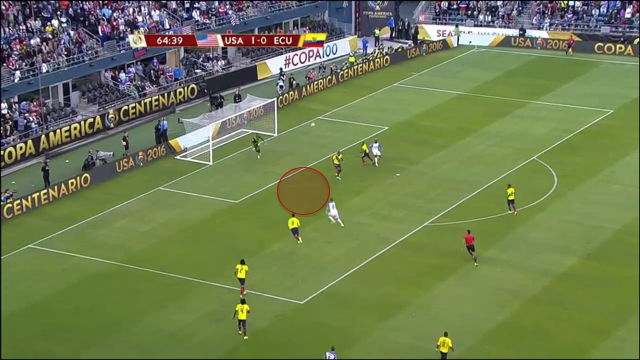 The Colombians ceded control of the ball but exploited the fissures that formed between the American lines when the forward players pushed too high up the pitch. 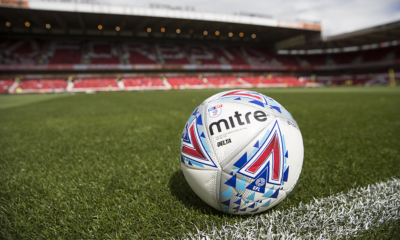 The result was a decisive 2-0 victory with the visitors perhaps unlucky to not collect a third goal. 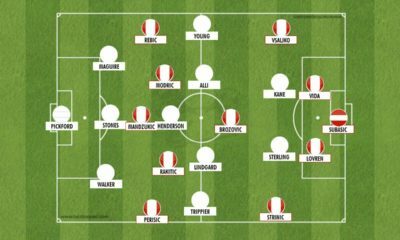 In their second and third matches against Costa Rica and Paraguay respectively, the Yanks found wing-oriented opponents who attempted to outflank their formation by constantly overloading wide areas. 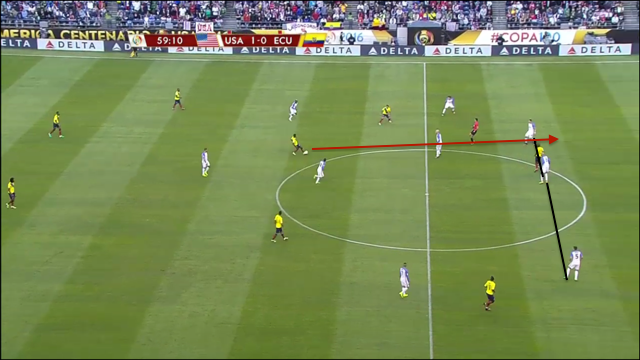 The Americans capitalized on their opponents’ wide positioning by seizing control of the middle of pitch. 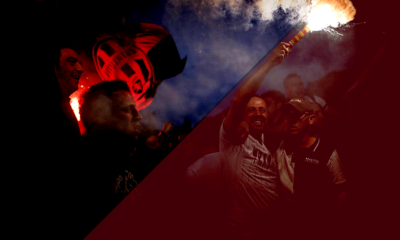 As a result, they both limited the effectiveness of their opponents’ crossing and controlled central territory necessary to successfully access the final third. 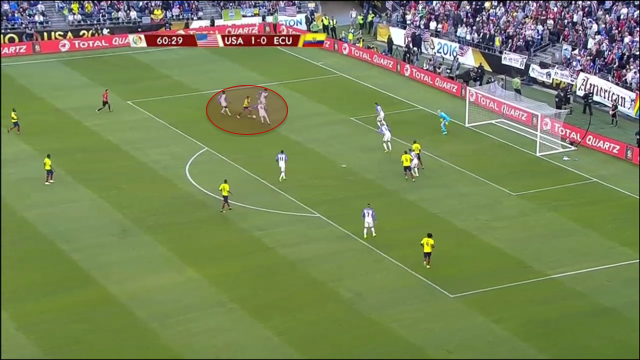 In Ecuador, the Americans found a more extreme version of their two previous opponents as Los Amarillos positioned their backs and wings in uncompromisingly wide roles and created chances almost exclusively through crafty dribbling and crossing. 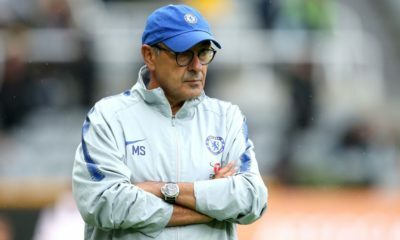 While lining up in a wide 4-4-2 is generally considered unacceptable in modern football, Gustavo Quinteros’ approach makes perfect sense when considering the players available for selection. Antonio Valencia, Jefferson Montero and Juan Carlos Paredes are Premier League wide players while West Ham frontman Enner Valencia is an out-and-out striker who excels in aerial challenges. Lacking any real central creative force, Quinteros quite sensibly instructed his wingers to position themselves high and wide to provide a steady flow of crosses into the box. 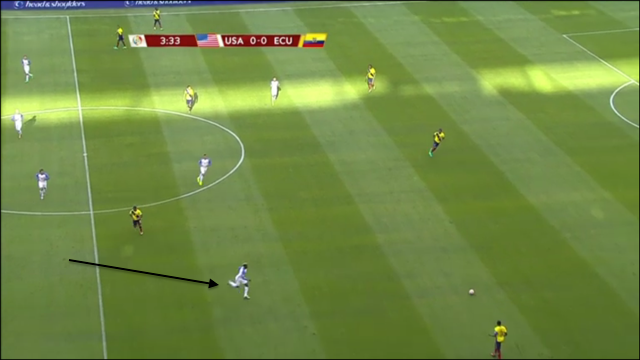 Jürgen Klinsmann addressed this familiar challenge with a familiar solution: a hybrid 4-4-2 formation which morphed into a 4-3-3 when Gyasi Zardes pressed high on the right wing to prevent Ecuador from building from deep in their own half. 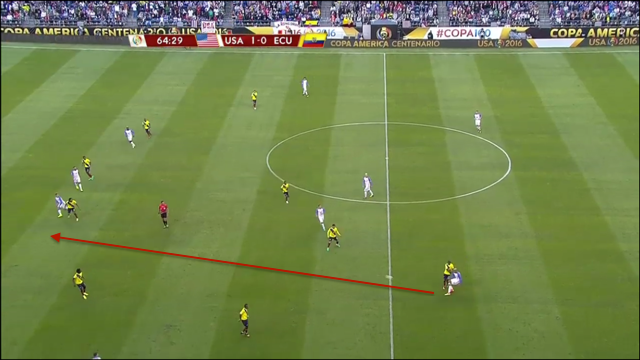 Deploying the same approach for three matches in a row, the Americans were very comfortable dropping deep when out of possession and leaving very little space between the first and second line. 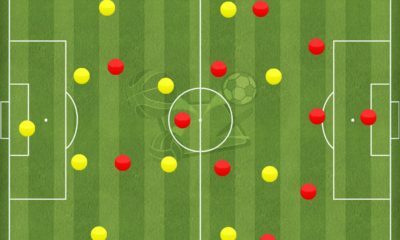 Each player aggressively challenged any Ecuadorian player who entered his zone often forcing the player in possession to drop the ball to one of the deeper-lying 6s. 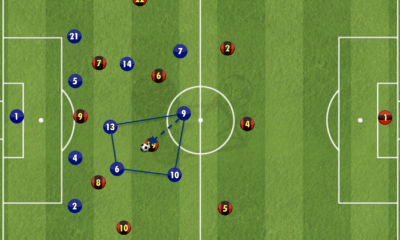 The resulting product consisted of two ball-oriented, staggered lines with players stepping forward to stop the ball and others dropping between the lines to prevent incisive passes. In the graphic below, Paredes has overlapped on the right side, so Valencia moves into the right half space. 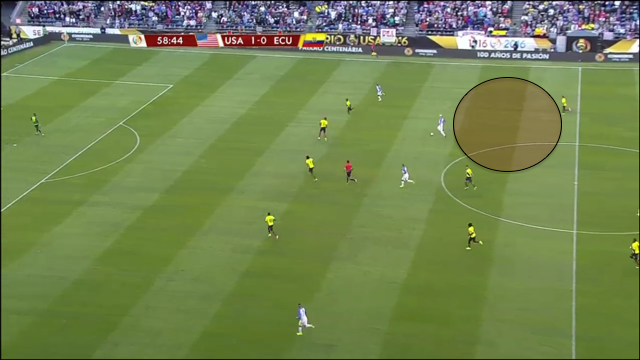 The entire American second line has filled in behind the ball, so Valencia drops the ball to Carlos Gruezo. 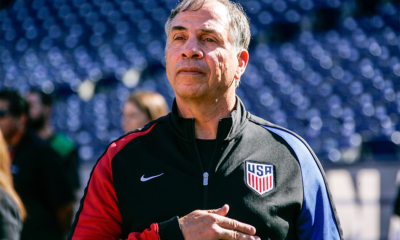 The two forwards, Enner Valencia and Michael Arroyo, position themselves at the center of the top of the box, but are outnumbered 3 to 2 by John Brooks, Geoff Cameron and Fabian Johnson. 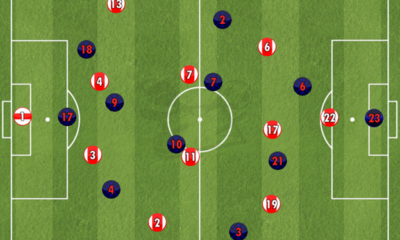 Montero and Paredes are tight to their respective touchlines leaving them inaccessible from Gruezo’s position. 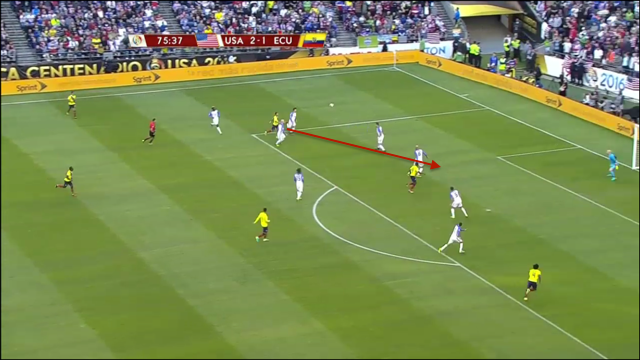 Jermaine Jones begins closing his position as soon as he receives the ball while Michael Bradley drops between the lines to prevent either one of the forwards from dropping and finding space. Faced with little time and no good options, Gruezo releases a tame shot which Guzan collects easily. In contrast, Los Amarillos were generally poor in defense as they were unable to advance a wing-oriented attack while also retaining a compact defensive shape. It appeared Michael Arroyo was tasked with tracking Michael Bradley to deny him the time and space necessary to dictate play. 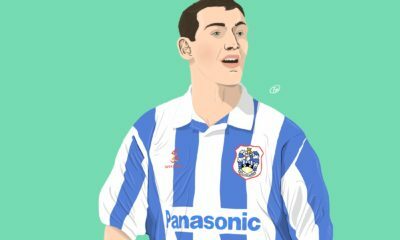 However, Bradley was undeterred and equally comfortable dropping into the back line or driving forward in order to find space. 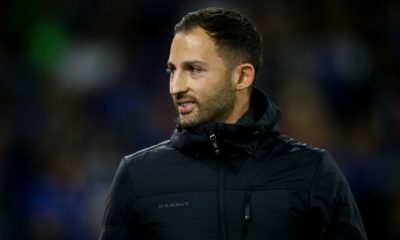 Arroyo was unable to follow Bradley all over the pitch leaving him with plenty of time to receive the ball, pick up his head and release a forward pass. 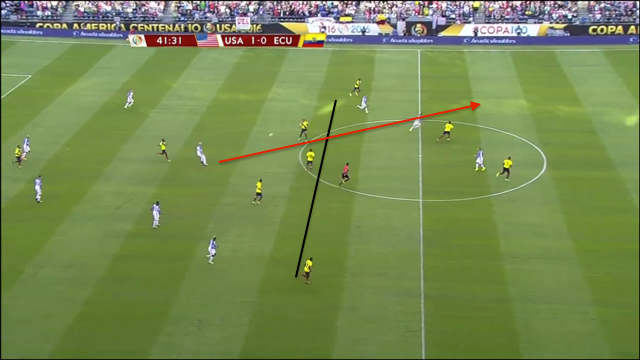 The extensive width of the first two Ecuadorian lines and unwillingness of the two forwards to relentlessly press the American back line meant that Bradley along with Cameron and Brooks had both the time to pick out accurate long range passes and the space into which to play said passes. The American trio ruthlessly exploited this gaping weakness and forced isolated center halves Frisco Erazo and Arturo Mina to make several crucial challenges in space. 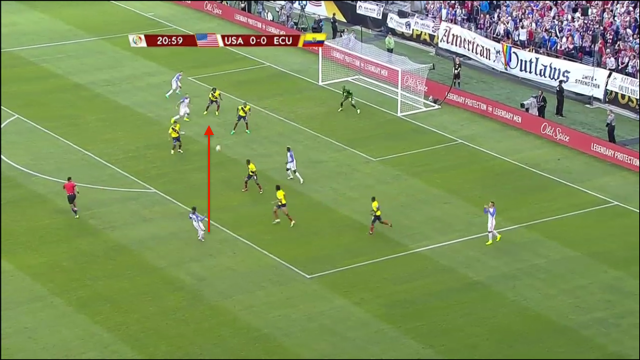 Despite their structural weakness in defense, the Ecuadorians remained opportunistic and nearly stole a goal just before halftime when a very poor Bradley back pass ended with Guzan barely managing to deflect an Arroyo shot away from goal. 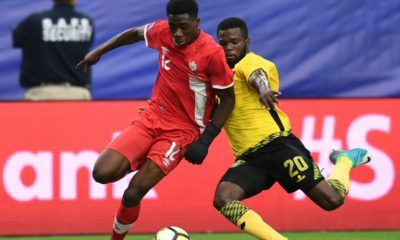 For the second time in as many matches, the Americans collected an unnecessary red card early in the second half which made a likely win much more difficult than necessary. The sequence started when Alejandro Bedoya dispossessed a frustrated Antonio Valencia who lashed out at the American player. The referee immediately ran over to Valencia and reached for his pocket. 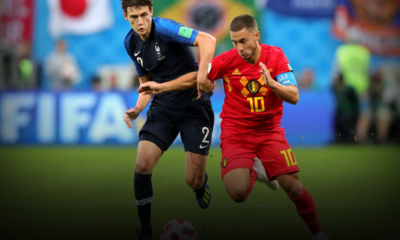 As the Manchester United man had already been cautioned in the first half, his dismissal would have forced Ecuador to chase the game down a goal and a man. However, before the referee dismissed Valencia, Jones arrived on scene and pointlessly struck Arroyo in the face. 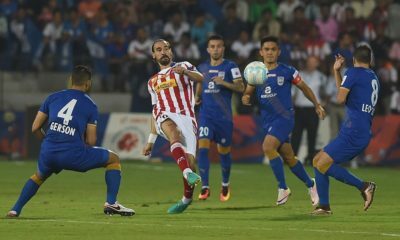 The referee gave the American a straight red card and both teams were reduced to ten men. 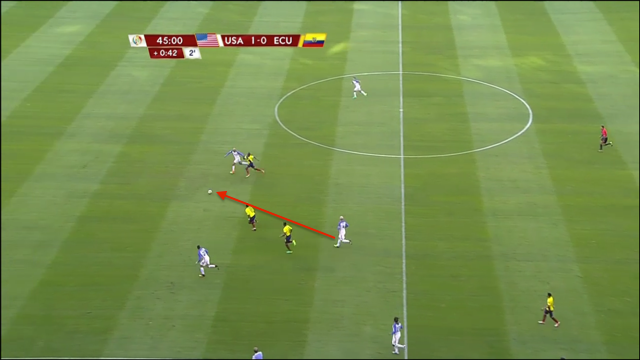 While the dismissal of one player from each team maintained numerical parity, the shift favored Ecuador’s speedy dribblers as the Americans could now move fewer players behind the ball. 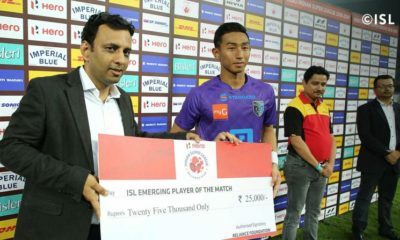 Much as he had done in the previous match, Klinsmann chose the logical option and continued utilizing two compact banks of four which dropped increasingly deep throughout the course of the second half. 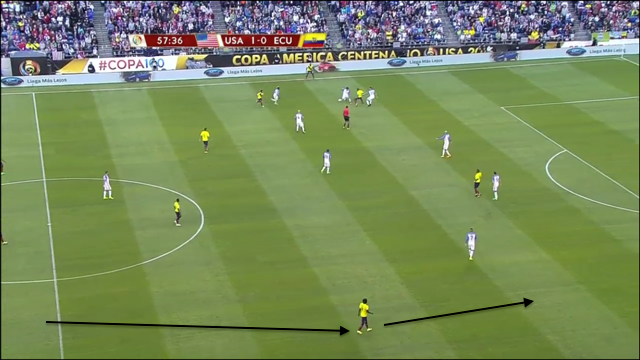 The Ecuadorians switched to a more fluid system where Paredes covered both right back and right wing and Arroyo dropped onto the right flank when Paredes dropped deep. Jeff Montero’s sudden explosion on the left wing ultimately altered the match more than any conscious tactical shift by either manager. 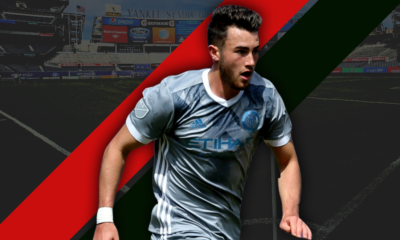 The Americans succeeded in creating the defensive matchup they wanted by maintaining minimal space between their lines and forcing the Swansea man to repeatedly beat two or three defenders in order to get a cross into the box. Unfortunately for them, that’s exactly what he did. Fortunately however, Enner Valencia was inexcusably poor in front of goal and failed to convert several close range opportunities. 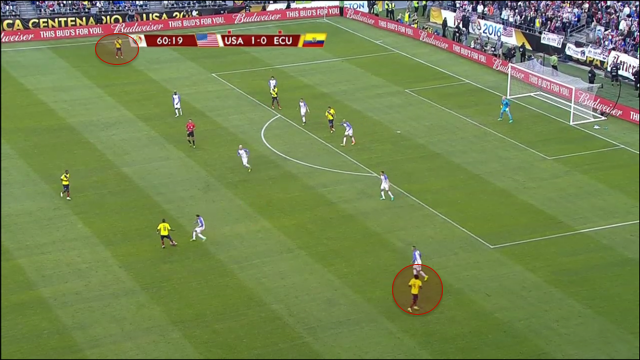 In spite of their positional weakness throughout the game, Ecuador should have prevented both goals. 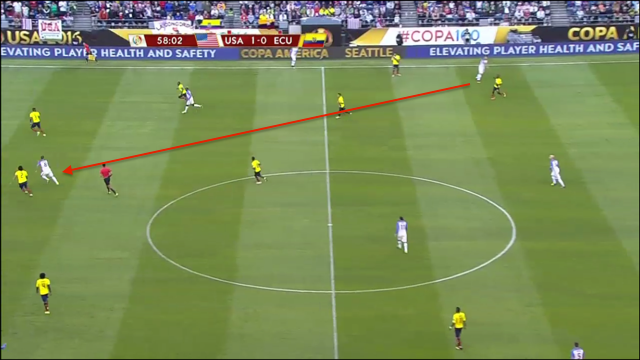 The graphic below demonstrates that Ecuador has three defenders within Clint Dempsey’s immediate vicinity. 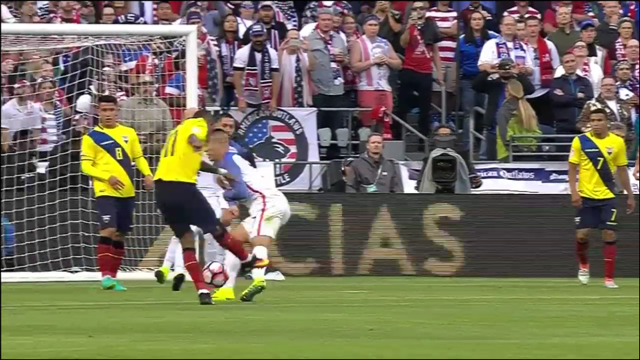 While Jones delivers a spectacular curling cross, Erazo could cut off Dempsey’s run by stepping forward. 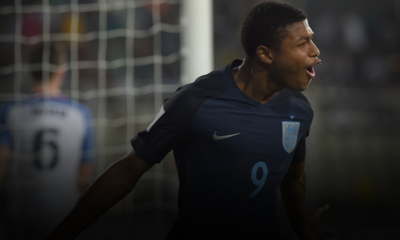 However, he stands still and Dempsey buries the header. The second goal resulted from the identical mistake as this time Gyasi Zardes manages to beat both center halves for a knockdown header. Dempsey is unmarked as both defenders play Matt Besler’s cross, so he slides a shot/pass across the mouth of goal for a Zardes tap-in. Finally, for all of Valencia’s close-range headers, their one goal resulted from a cut back pass from a set piece near the touchline. 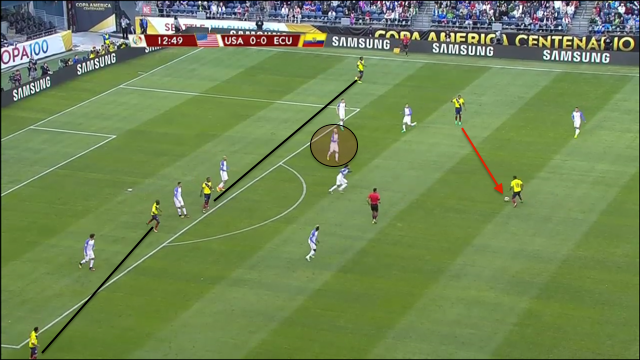 Arroyo collects the driven pass at the top of the box where Wood meets him and is in position to deflect the shot away. However, instead of laying out and maximizing the size of his body, he does the opposite by turning away from the shot. 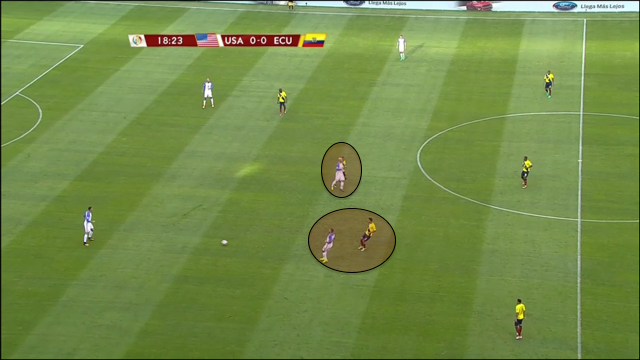 As a result, Arroyo’s low driven shot travels clean through on goal and just beats Guzan’s right hand. 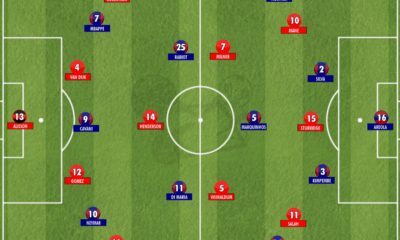 For the third game in a row, the Americans have survived a cagey match through a combination of positional superiority and poor finishing from their opponents. Argentina, the deserved no. 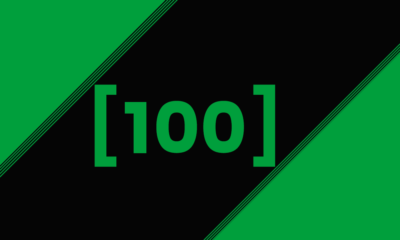 1 ranked team in the world, presents an entirely different challenge. The Albiceleste will attack relentlessly and unceasingly from the flanks, the half spaces and the middle of the pitch, and unlike their previous opponents, the Argentinians boast arguably three of the top five goal scorers in the world. 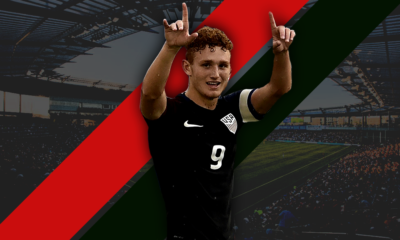 Expect defensive stopper Kyle Beckerman to join a 5-man midfield which sits very deep for most of the game. 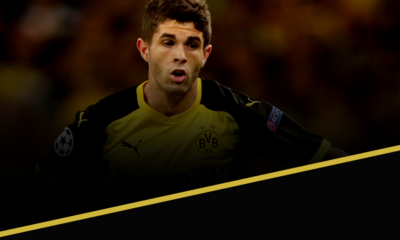 If the Americans are still level late in the match, look for Klinsmann to present 17-year-old Borussia Dortmund attacker Christian Pulisic with the chance to seize a very unlikely winner. 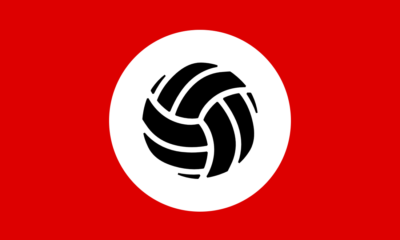 Meanwhile, Los Amarillos must be extremely disappointed that they failed to convert several excellent opportunities into at least a penalty shootout (Copa America oddly has no extra time). Nevertheless, Ecuador returns home having performed well in their four Copa America games and now looks to build on their second place position in World Cup qualifiers. 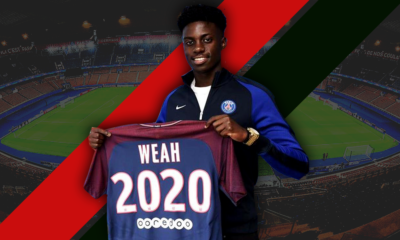 Michael Thomas is a loyal United States National Team and Arsenal supporter.Naturally, he loves the Round of 16 even if his teams always lose.